The 4KIDS program is BT's awesomely, fun after-school "enrichment" program where students get to learn beyond the curriculum. Students discover new talents from Computer Programming, LEGO building, Dance, Science, Athletics, Music & and so much more! The 4KIDS classes are coordinated and run by BTEF volunteers, and offered to all BT students in K-8th grade for a nominal $50 for 8-week session, even though many classes cost much more. Classes are taught by RVS teachers as well as outside vendors. If you have ideas for exciting new classes, please share with us. $50.00 registration fee per child for each course. 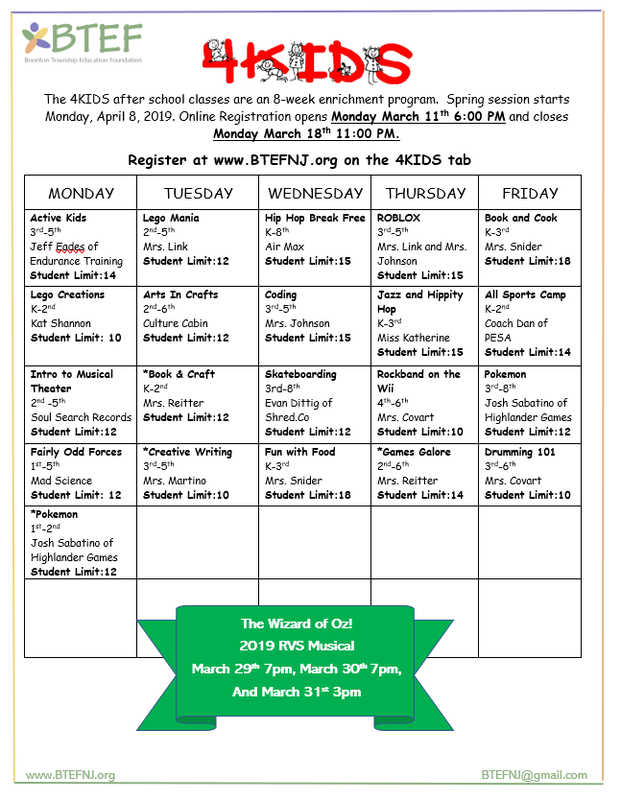 You may sign up for more than one class! • All children remain after school and go directly to their enrichment class. *** Children must be picked up by 3:30 sharp. PLEASE NOTE NEW SECURITY GUIDELINES! Late pickup, after the 2nd violation, will result in dismissal from the program. No refund will be given. ***Please note 4Kids is a volunteer organization. Class size is limited. We will try to accommodate all registrations.